Jewellery of the highest quality, custom made in Adelaide. Exquisite custom made jewellery for any occasion. We can design and manufacture to our design or yours. We can manufacture any wedding ring … from mild to wild. Let us quote on bringing your old antique pieces back to life. We can transform old and outdated pieces that you wouldn’t otherwise wear. We can advise you on all your jewellery maintenance and cleaning needs. If you require documentation of valuations for insurance purposes, we can assist. Want to know how much your grandmothers antique earrings are worth today? We can help. Want to gift a loved one some jewellery but don’t know what style to purchase? Perhaps a gift voucher is the answer. 18ct Rose & White Gold Pink Sapphire & Diamond cluster ring incorporating 1.16ct oval cut natural Pink Sapphire surrounded by small Pink Sapphires (total weight 0.76cts) and round brilliant cut Diamonds (total Diamond weight 1.60cts) claw set in split band. 18ct White Gold South Sea Pearl & chenier set Diamond pendant. 18ct Yellow & White Gold Mokume Gane style Engagement ring incorporating solitaire round brilliant cut Diamond 0.51cts bezel set with matching Mokume Gane wedding ring. The method of Mokume Gane results in a wood grain effect and every design is individual. Two cluster style Diamond rings with a combination of 18ct Yellow Gold and 18ct White Gold. 18ct White Gold multi-stone Diamond ring incorporating 1.01ct Princess cut Diamond rail set encrusted with pavè set Diamonds (total 0.84cts) in upswept shoulders. 18ct White Gold Engagement ring incorporating 0.60ct round brilliant cut Diamond with two baguette natural Pink Sapphires (total weight 0.29cts) set either side of two round brilliant cut Diamonds (total weight 0.06cts) with hand-engraved scroll design on the sides. 18ct White Gold Wedding ring incorporating three baguette natural Pink Sapphires (total weight 0.44cts) set either side of two round brilliant cut Diamonds (total weight 0.06cts) with hand-engraved scroll design on the sides. 18ct White Gold Sapphire & Diamond ring incorporating 1.22ct square cut natural Pink Sapphire bezel set with six Princess cut Diamonds totalling 1.0cts channel set in shoulders. 18ct Yellow & White Gold Sapphire & Diamond ring incorporating 6.04ct cushion cut Ceylon Sapphire with fourteen surrounding Diamonds claw set. Total Diamond weight 1.14cts. 18ct Yellow & White Gold Art Deco style marquise shaped Diamond ring incorporating 0.13ct Princess cut Diamond bezel set with small round brilliant cut Diamonds bead set into ‘fleur-de-lys’ motifs. 18ct Yellow & White Gold Sapphire & Pearl pendant incorporating 2.08ct trilliant cut Australian Sapphire claw set with Baguette & round brilliant cut Diamonds and a 13.5mm South Sea Pearl. Total Diamond weight 0.50cts. This pendant is suspended from an 18ct Yellow Gold open curb link chain. 18ct White Gold Black Pearl pendant incorporating 10.5mm Black South Sea cultured Pearl surrounded by Black & White Diamonds pavè set in curve design. Total Diamond weight 0.42cts. This pendant is suspended on a black collier. 18ct White Gold Garnet & Diamond ring incorporating 1.32ct trillion cut natural Tsavorite Garnet with Princess cut Diamonds channel set in band and small round brilliant cut Diamonds pressure set in both sides. Total Diamond weight 0.78cts. 18ct White Gold Tourmaline & Pearl pendant incorporating 2.57ct trillion cut Pink Tourmaline bezel set with natural 13mm South Sea Pearl suspended from Baguette & round brilliant cut Diamonds. Total Diamond weight 0.31cts. This pendant is suspended from an 18ct White Gold curb link chain. 18ct White Gold Pink Sapphire & Diamond drop pendant incorporating square cut Pink Sapphire with Diamonds pavè set. Total Diamond weight 0.08cts. This pendant is suspended from an 18ct White Gold cable chain. 18ct Yellow Gold South Sea Pearl & Diamond pendant incorporating 9.5mm South Sea Pearl with a run of pavè set Diamonds on the curve. Total Diamond weight 0.34cts. The pendant is suspended from an 18ct Yellow Gold twisted wire cable. 18ct White Gold Sapphire & Diamond ring incorporating 2.5ct oval cut Ceylon Sapphire with round brilliant cut Diamonds pavè set in split upswept shoulders. Total Diamond weight 0.40cts. 18ct White Gold 3-stone Princess cut Diamond ring incorporating the main Princess cut Diamond claw set with matching Princess cut Diamonds bezel set on either side of the centre stone. 18ct Yellow Gold & Titanium Butterfly brooch incorporating drop shaped Freshwater Pearl and three round brilliant cut Diamonds. Total Diamond weight 0.22cts. Style 1: 18ct Yellow & White Gold ring incorporating 1.45ct pear shaped natural Pink Tourmaline with a combination of pavè and pressure set round brilliant cut Diamonds. Total Diamond weight 0.46cts. Style 2: 18ct White Gold ring incorporating 1.31ct oval shaped natural Pink Sapphire with round brilliant cut Diamonds pave set in shoulders and sides of band and encrusted in v-shaped centre setting. Total Diamond weight 1.14cts. Two 18ct Yellow & White Gold Diamond rings both styles incorporate a round brilliant cut Diamond semi-bezel set with small round brilliant cut Diamonds pavè set and graduating along both side of the band. 18ct White Gold Aquamarine & Diamond ring incorporating 5.52ct oval cut natural Aquamarine surrounded by pavè set round brilliant cut Diamonds in split shank style. Total Diamond weight 0.42cts. 18ct White Gold pavè set Diamond cross. 18ct Yellow & White Gold Diamond & Pearl drop earrings incorporating two 13mm South Sea cultured Pearls suspended from curved diamond shaped plates with Diamonds pavè set. Total Diamond weight 0.60cts. 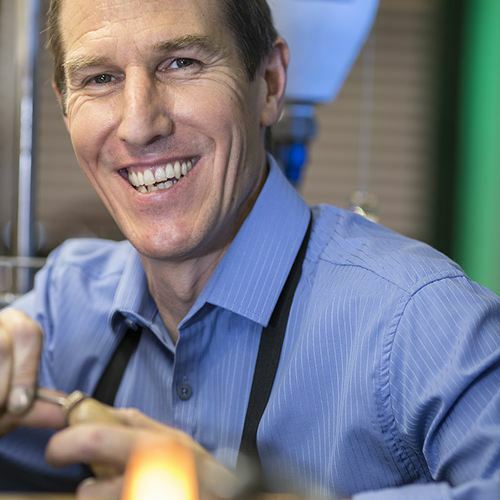 Making the best jewellery in South Australia requires the best jewellers in South Australia. 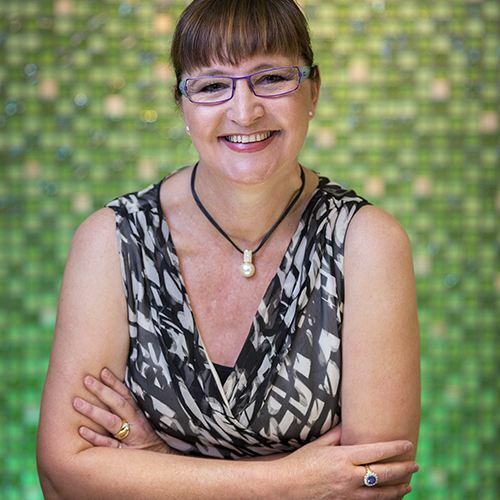 Andrea is Chris’ wife and manages all the business and financial administration in a professional and efficient manner. 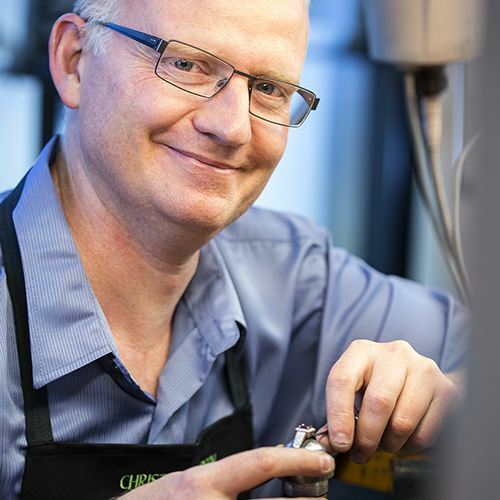 Craig has been a diamond ring maker/setter for 27 years and has worked alongside Chris for 14 years. 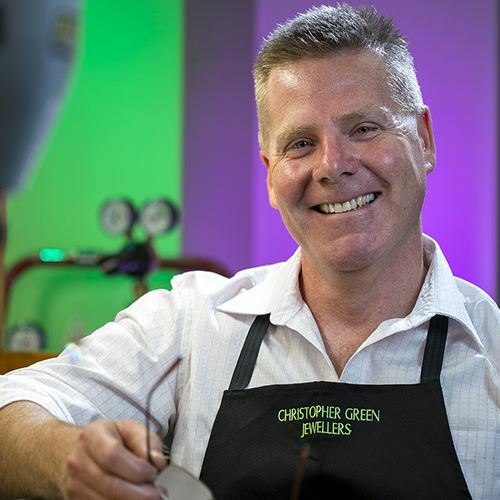 Craig is highly skilled and very proficient in restoring antique and filigree jewellery. He also specialises in design and exceptional customer service. Steven has been a jeweller for 27 years and has worked alongside Chris for 9 years. Steven is exceptional at repairs, alterations and doing the work of two people. There is nothing he can’t fix! Come and see us on Level 1, 55 Galwer Place, Adelaide SA 5000.